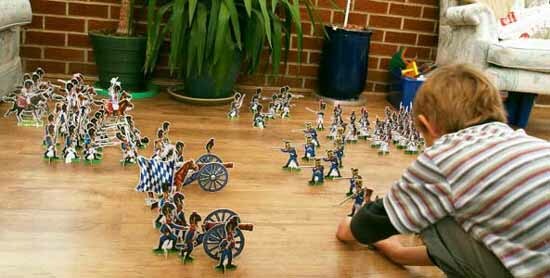 Walkerloo Toy Soldiers are paper soldiers for the 21st Century. They are expressive, historically accurate illustrations mounted on to both sides of thick durable re-cycled card. Simply pop them out and set them up. Finally, toy soldiers which are full of history and colour yet affordable enough to fill the floor. Toys are a great way of getting children interested in history, able to spark interest and imagination. Playing and arranging my soldiers brings up all kinds of questions - who are they? why those crazy cloths? why were they fighting in the first place? Historical toys provide a way to find out about war, one of humanity's most calamitous creations. So far we have toy soldiers from 10 different regiments who fought at the battle of Waterloo. For each regiment has painted groups of soldiers in realistic animated actions and different ranks to give units vitality. Ideal for kids, both the small size and the very big size, that like to get down on the floor and play. To view a set of simple War Game Rules, please click here.